I have only recently joined the Fiverr affiliate program and I recently discovered I made money with them… money that I hadn’t realised I’d made! To be honest, I didn’t have many affiliate links to set up yet and wasn’t expecting it, so it was a welcome surprise. Naturally, since the discovery, I decided I would incorporate Fiverr more and also went back to old posts to add links, which I’d long intended to add before. This discovery led me to want to know more about the program that I’d neglected and discover how I could better utilise the program and make more sales! 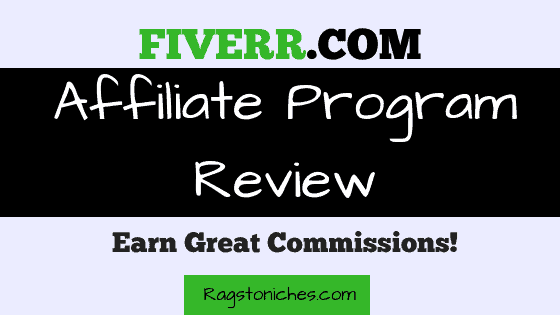 In my Fiverr affiliate program review today, I will explain to you how you can sign up, (step-by-step) as well as walk you through the commission structure. 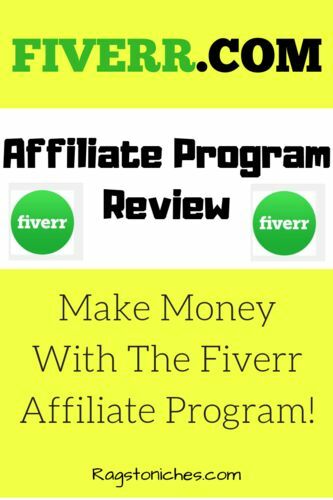 I will also share the benefit of joining up with the affiliate network, such as”AWIN;” which is where you can find the Fiverr affiliate program housed. Unsure how to set up a money making blog? Check out my step-by-step guide! If you discovered this review, chances are that you already know about Fiverr… But if you’re just a regular reader, you may not! So, Fiverr is a huge online marketplace, where you can purchase various services, starting from just $5. This is regular a go-to place for bloggers and online marketers to get stuff done, at a reasonable price. If you’re unsure which gigs are a good choice, you should check out my Fiverr post here. Basically, it’s a real mixed bag of services – but with a particular emphasis on services that help online businesses. What About The Fiverr Affiliate Program? I presume you may already be familiar with affiliate programs, but I will just explain this in a nutshell below. The Fiverr affiliate program enables you to recommend services on Fiverr, and receive a commission when a purchase is made. You will be able to convert regular Fiverr links, into affiliate links once you’re signed up to their program. You can then add these links to your blog, as you write relevant content. These links are specifically tracked and connected to you, so Fiverr will know when someone has come via your website or blog. How much commission you make, will depend on the service they’ve purchased. This affiliate program has a CPA, (Cost-Per-Action) structure and this means you will only be paid a one-off set fee for your referral. You can only earn once per NEW customer, so if someone goes via your link that has already previously bought something on Fiverr, you won’t get a commission unfortunately. However for new customers, you can earn up to $100 – which would be a nice sale! It also doesn’t matter how much they spend. They could get the cheapest gig on Fiverr for $5, you would still get the corresponding category commission; which is pretty awesome. So, for example; if you write a post about the best gigs on Fiverr doing whiteboard/explanation videos and someone purchases a related service via your link – you would make $50! 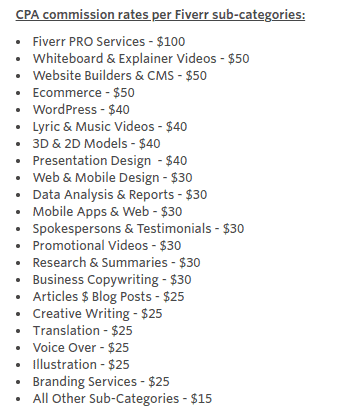 Fiverr are generous with their commission structure here, so it’s a good one to go for. Be Cautious Which Products You Do Recommend! Ideally, you’ll already have made some purchases on Fiverr and already have some favourite gigs in mind. This is because, there is certainly some highs and lows when it comes to quality on Fiverr. I went over some of the best vs worst gigs on Fiverr over at this post. You want to be sure that the services you recommend are good quality to your readers. Being a buyer on Fiverr initially will soon help you work out what type of gigs are worth your time and money. You can also get some idea from the feedback. Many of the best Fiverr sellers, could have thousands of reviews. You also want to be sure that what gigs you recommend fit your audience. Your conversions won’t be good if you’re recommending products that aren’t relevant tot them! What Type Of Sites Work Well With The Fiverr Affiliate Program? Certainly there are many different types of websites that could work well with this program. Say you have a site about WordPress, there are lots of WordPress related gigs and services. Or maybe you have a blog about video marketing, there are many video related gigs on Fiverr and some of those are really good. As well as spend more for some of the more premium services. If your blog is relating to internet marketing, affiliate marketing, or blogging in general – then there are a broad range of services you could recommend. Just be cautious on the freelance writing front, I would purchase some gigs in that space prior to recommending any. But things like, whiteboard videos, graphic design work, (like logos), WordPress set up/customization, or keyword research type gigs could be a good fit. Write a list of some of the potential gigs that would fit in with your niche. Loads of gigs to choose from. You can make good commissions, even on a $5 sale. Gigs that can be useful to you too & you can affordably research gigs and recommend your favourites. The flat rate commissions are generous. One off commissions – nothing recurring, (but that is common anyway). Flat based commission – so, it doesn’t matter how much they buy, you still get a flat fee. The fees are pretty good though and your commission can often end up being MORE than they spend. Not all gigs are going to be great quality, so you need to be careful what you’re promoting. You can either join the Fiverr affiliate program directly over here, OR you can also join Fiverr at AWIN, which is an affiliate network that houses many different programs. I am already with AWIN, because I originally joined it to sign up with the ETSY affiliate program, so that’s the way I’m walking you through today. If you’re only looking to promote Fiverr alone, then you could go with them directly. However, by joining AWIN, you can then have access to thousands of other affiliate programs, that could compliment this program. Udemy,(a good option that compliments the Fiverr program). Etsy, (I use on another blog). But there are thousands of programs that you can choose from. It’s really useful to join an affiliate network, because all your earnings are combined in one place. It can be hard to keep track of individual programs, where you may only be making the odd sale here and there. So, being part of a network helps you to keep track of multiple programs, test out programs and see which ones convert the best. All your earnings will also combine into one payment, which is useful. Step 1) Sign Up With Awin! Is to sign up with AWIN here. It’s simple to sign up, just follow their instructions. They do have a $5 sign-up charge for new affiliates, it’s for verification purposes. Once they verify you, they return the $5 into your AWIN account and you’ll be able to withdraw it on your first pay out. It is something that people grumble about, understandably, but it’s not a big fee and you do get it back once you start making sales. Once you’re all signed up, the next step is to simply find Fiverr. Once you’ve found it, you will see a “join” option, in a box to the left. You can then simply apply and there is a space for you to write additional information in support of your application. In this section, outline why you want to join the Fiverr affiliate program, how this compliments your niche and how you’re planning on driving traffic and sales. Before you join, you can check out all the details about the program in the tabs shown below and it’s a good idea to have a read through and understand the rules. You’ll then need to wait until you’re accepted. Fiverr have a very high acceptance rate, so you should be good! It could be a week or so for them to approve you though, so you may have a little wait! This affiliate network also has a really easy way for you to input links, which can really save you time. You simply upload a plugin via WordPress, follow the simple instructions and the plugin will automatically convert any regular link, into an affiliate link. What’s more, if they detect a link that is connected to AWIN, but you haven’t signed up yet; they will actually apply to that affiliate program for you. It will also automatically change any links on your site – so, if you had links on there from months ago that could be AWIN links, those will automatically become affiliate links. It will also mean that your affiliate links are always correct, as there can be room for error when you’re copying and pasting. You don’t HAVE to install this plugin… If you don’t feel it’s necessary, you can simply create your links in the deep-linking tool. (Visit *links & tools* on the main dashboard and then, *link-builder,* to build your links). This allows you to convert most pages of a site into an affiliate links. Just be sure to check the T&Cs of a program, as some will only allow affiliate links to certain places. If you have Google Chrome or Firefox, there is also a free handy browser extension that you can use to quickly create affiliate links. Simply go to chrome web store, search for *AWIN* and add! *That being said, I haven’t been able to create links with it recently – it’s redirected me to AWIN direct. So, I will see how that goes! Conclusion – Is The Fiverr Affiliate Program Worth Joining? 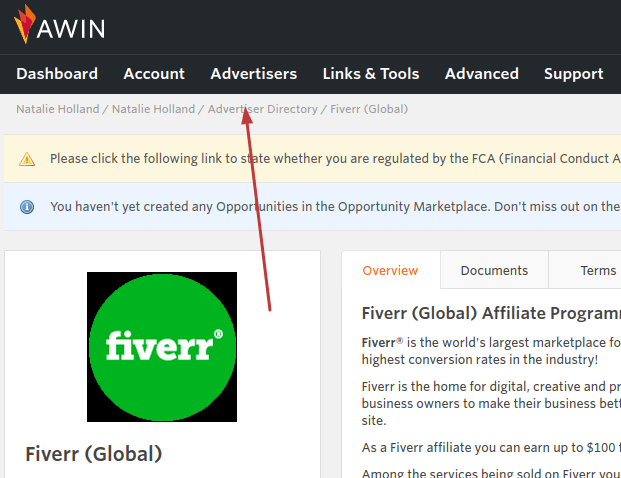 I’ve only recently started incorporating the Fiverr affiliate links into my website more. When I first signed up, I didn’t even check the commission structure! It’s only when I saw $40 in my account from Fiverr that I realised I’d been paid that for 2 small sales and that was at nearly a 15% conversion rate. I’d also completely missed an additional $15 sale I’d made. Once I took a look at some of the commission rates, I realised that this could actually turn into a nice little additional income stream. Fiverr offers a whole range of services that can attract a wide range of audiences. Since they have budget services, right up to gigs ranging in their thousands. But there is certainly potential here to make some money and it’s a good program that you can easy mix with other affiliate programs. Let me know how you get on with Fiverr and if you have any questions, let me know in the comments! Affiliate marketing can be really difficult to begin with – typically, it could take several months to see those initial first sales, (if you stick with it!). If you’re going it alone, it can be even harder to keep going. I find it helpful being part of a community, where I access ongoing training, support and help from other people in the same boat.